For my upcoming post at Ribbonfarm, I've been thinking about what an "embodied worldview" looks like. By this I mean: an understanding of the world that begins with the human body, one in which we see ourselves as embodied creatures, situated in the world, enmeshed in relationships, and acting with limited self-consciousness. If anyone needs this enterprise, it's me. I'm an engineer with a degree in philosophy. When I'm not building systems to move bits around in a machine, I'm rearranging words on a screen. Programming and writing are two of the most decontextualized, disembodied activities a human can pursue — aside from maybe math and chess, which were two of my formative childhood hobbies. In contrast, the embodied worldview emphasizes the role of the body in perception, cognition, communication, and social action. It emphasizes empathy over analysis. Relationships over rules. Music over language, and poetry over prose. It's a visceral rather than a cerebral mode of experience. It's not that the embodied worldview is intended to replace its abstract, analytical, disembodied counterpart. They're complements — two different but equally(?) important ways of looking at things. And historically, I've radically undervalued the embodied way of looking at the world. I'll have more to say about this in my upcoming post. For now, I just wanted to leave you with some resources — videos, links, and excerpts from books I've been reading. Think of these as breadcrumbs left along the trail of my research. The Machine Stops by E. M Forster is a short story published in 1909 about the internet(!!). It's required reading for first-year students at NYU's ITP program (thanks Di! ), and for good reason: it makes some uncanny predictions about how society interacts with technology. And along the way, it illustrates the pathologies of a system that's lost touch with the body and with physical reality. Highly, highly recommended. Over at The Moth, Andrew Solomon tells a story about battling depression and scouring the world for a cure. What he finds in Africa sounds insane, until he contrasts it with Western practices. Jacques Hadamard, the famous French mathematician, in the late stages of his life, decided to poll his 99 buddies, who made up together the 100 great mathematicians and physicists on the earth, and he asked them, "How do you do your thing?" They were all personal friends of his, so they wrote back depositions. Only a few, out of the hundred, claimed to use mathematical symbology at all. Quite a surprise. All of them said they did it mostly in imagery or figurative terms. An amazing 30% or so, including Einstein, were down here in the mudpies [doing]. The sad part of [the doing -> images -> symbols] diagram is that every child in the United States is taught math and physics through this [symbolic] channel. The channel that almost no adult creative mathematician or physicist uses to do it… They use this channel to communicate, but not to do their thing. Much of our education is founded on those principles, that just because we can talk about something, there is a naive belief that we can teach through talking and listening. Watch a speaker become very vulnerable onstage. The Lessons of History by Will and Ariel Durant is an amazing book. Clocking in at just over 100 pages, it's a concise, elegant summary of the authors' 11-volume, 10,000-page series, The Story of Civilization. Its language is breathtaking — and eminently quotable. Click here to read some of my favorite passages. The book's subtitle is, "The divided brain and the making of the modern world." It's about how the left and right hemispheres of the brain have a different way of approaching the world (a different way of processing and making sense of information), and about how the left hemisphere has come to dominate the modern West. You can get a quick (11-minute) idea of what the book is about in a great RSA Animate video, or you can read some of the passages that caught my attention. A book written by an improv teacher, for other improv teachers, has (in my opinion) no business being so damn fascinating and useful outside the theater. But that's Impro for you. It's a real gem. The whole book is amazing, but chapters 2 and 5 are the most relevant for the embodied worldview. Chapter 2 discusses social status, which is hugely important in human interaction. It's the first thing Johnstone (the author) teaches his improv students, because it's the highest order bit for figuring out what's happening in a scene — and by extension, in most real-world 'scenes' as well. In fact, it's so important that we often don't even notice it. Maybe we process it too far down in our consciousness (or maybe it's just taboo). Read more excerpts from chapter 2 here. Chapter 2 is very accessible. Chapter 5, on the other hand, is weird, wild, and disconcerting. I'd say it's almost alien, but it comes to us by way of a very human author, so it's recognizable at least in translation. The title of the chapter is "Masks and Trance," and it's about the use of character masks (and their attendant trance states) in the theater — a technique that produces powerful behavior and personality transformations in the actors who use the technique. 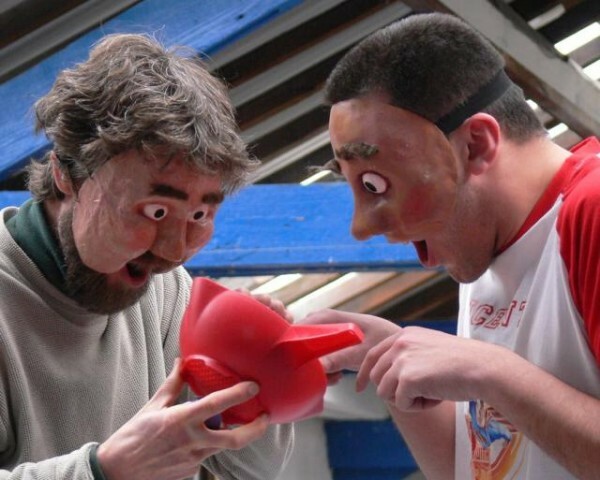 Second, the actors are told to "make your mouth fit the mask, and hold it so that the mouth and the mask make one face." Finally, and most important, the actors are presented with a mirror as soon as they put on a mask. This lets them see what they look like with their new, strange, exaggerated features. The overall effect is to give them an immediate and powerful sense of the character the mask is 'asking' them to play. If you're interested, you should really go read the whole book. But here are my highlights from chapter 5, to whet your appetite. Originally published February 17, 2013.